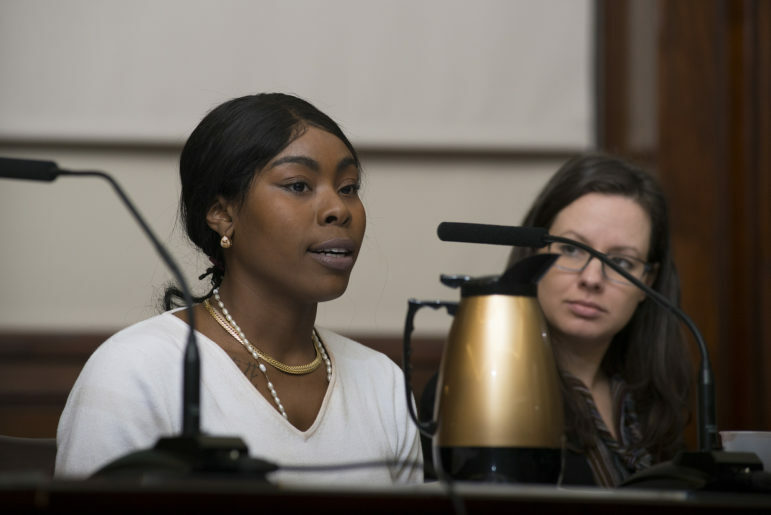 Jazmine Headley testifies at a February 4 hearing of the City Council’s General Welfare Committee. In December 2018, a cell phone video capturing Human Resource Administration and New York Police Department officers assaulting Jazmine Headley and prying her infant son out of her arms at a Brooklyn HRA office went viral. The disturbing video showed Ms. Headley’s nightmarish experience of trying to obtain child-care assistance from the chief government agency charged with fighting poverty and income inequality in New York City. Mistreatment of benefits applicants and recipients at HRA centers is common. When Ms. Headley was assaulted in December, the Urban Justice Center’s Safety Net Project was already in the final stages of editing The Bureaucracy of Benefits: Struggling to Access Public Assistance and SNAP in New York City, which we launched Monday to highlight the challenges, disrespect and abuse far too many people face at HRA centers across the five boroughs. • HRA centers in the Bronx – the city’s poorest borough – are overloaded and overwhelmed, with Bronx respondents reporting the most significant difficulties engaging with HRA. The Safety Net Project provides free legal services to low-income households with public benefit issues. While Ms. Headley’s story is horrific, it is unfortunately not unique. For us, it is routine to hear stories from our clients of grossly inadequate and traumatic treatment at HRA centers. And while physical assaults are rare, abuse is not. This abuse is intrinsically connected to poverty, racism and sexism. At HRA, under what is ostensibly one of the most progressive administrations in the nation, people who are poor are simply not treated with the dignity, humanity, and respect they deserve. It is easy to be outraged by the video of the violence committed against Ms. Headley. It’s much harder to sustain and direct the collective indignation it has sparked to ensure that we begin to address the underlying issues that led to her assault, and to the difficulties experienced by those who rely on benefits to survive. Our moral outrage must be channeled into better public policy; as a city, we must demand that HRA has the resources to hire sufficient staff, train them appropriately, and create more welcoming and family-friendly offices. Community organizing groups working at the intersections of poverty, sexism and racism have called for more responsive public aid services for decades, if not longer, and it is time the mayor heeds that call. We are grateful to City Councilmember Stephen Levin and the other members of New York City Council’s General Welfare Committee for holding this week’s hearing to introduce 13 bills focused on the treatment of clients and the quality of services at HRA. We were also glad to be joined at a press conference prior to the hearing by several members of the Progressive Caucus and Women’s Caucus, all of whom testified about the necessity to make critical reforms at HRA. Most importantly, we were struck by the courage of Ms. Headley, Brenda Riley, Charisma White, and other women of color who each testified about their own unique and deeply personal traumas with HRA. The level of courage it takes to speak out publicly on these matters is awe-inspiring. We hope the de Blasio administration will draw from the lessons embedded in these women’s powerful stories in continuing to make much-needed reforms. Scott Wagner is the managing director of the Safety Net Project at the Urban Justice Center. But the number of SNAP participants in the city keeps falling. That could reflect good news about the economy, the impact of federal benefit cuts or the persistence at the city level of obstacles to families getting the help they need. A lack of supportive housing and the tendency of many landlords to refused city housing vouchers mean that many formerly incarcerated people end up in shelters or on the street.